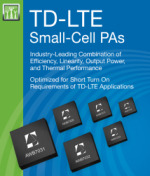 ANADIGICS has introduced six new power amplifiers (PAs) for TD-LTE (Time-Division Long-Term Evolution) small-cell applications. These are AWB7031, AWB7032, AWB7228, AWB7231, AWB7232 and AWB7239 TD-LTE power amplifiers and optimized for small-cell applications including picocells, femtocells and customer premises equipment (CPE). As femto cells become more ubiquitous it is essential to provide seamless mobility between macro and femto cells to reap the full benefits and improve user experience. Qualcomm Research's active hand-in for UMTS small cell solution offers a seamless connection in addition to several other benefits. April 22, 2014 - Athena Wireless exhibits its Pixie LTE small cell that includes millimeter-wave backhaul in a package the size of a smoke detector during the IWCE 2014 show in Las Vegas. Pixie now supports operation on the 700 MHz Band 14 spectrum licensed to FirstNet. Lexington, Massachusetts, February 24, 2014 - Polaris Networks, a leading provider of LTE EPC software solutions to Public Safety, Rural Operators and Defense Projects and, Public Wireless, Inc.
ETSI has published a new edition of the ICT security related standards white paper, which covers the range of work, including mobile communications. In 2014, standalone 4G LTE femtocells will have greater presence in the market following the general development of the LTE market, but the key player is expected to be 3G/LTE multimode. A recent ABI Research report expects LTE deployments to deliver population coverage of 57% (4.2 billion) by 2018 while legacy WCDMA and CDMA2000 to cover 31% (2.3 billion). Out of 470 LTE commitments tracked by the company, 193 have gone commercial. Several short interviews from LTEi World Summit from a small cell angle.